In reflecting on Allan Crawford’s life and family’s we see a remarkable story. They grew up in Banana Belt in a log cabin, and went on to reach high levels in their professions. 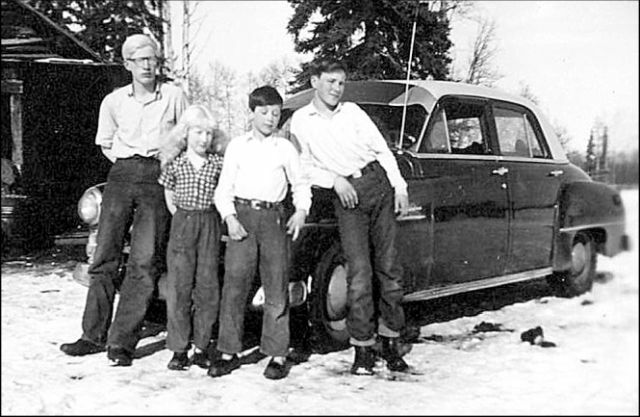 The Crawford children in 1955. Left to right: Charles, Mary, Allan and David. He says he views his own life as being in three phases. His first phase was growing up in the Banana Belt, and finishing his Grade 12 schooling in High Prairie. His second phase was raising his first family, and his teaching career. Phase Three was raising his second family, and his law career. “With respect to my first family, I was blessed. My children are Clayton, who now teaches power engineering at SAIT and stays active as a second degree black belt in Karate. Second is Gary who is a civil engineer and electrician in Edmonton. Charlene is a massage therapist and home maker with two youngsters who are my first grandchildren. Grace, and I are separated but have always co-operated in bringing up the kids. 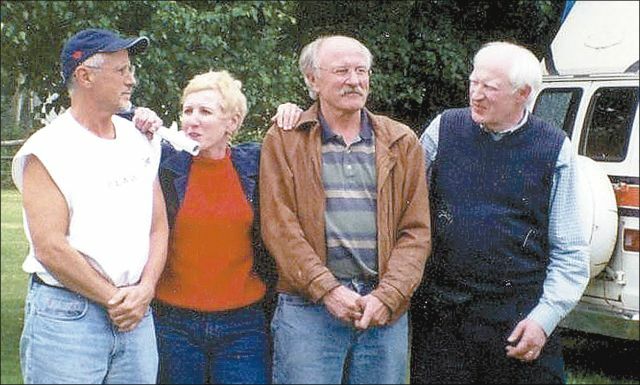 The Crawford children 50 years later in 2005. Left to right: Allan, Mary, David and Charles. Allan is a prime example of a young person from a small, rural area who left for higher education, and returned to make not one, but two careers where his roots were planted. Allan coached many school basketball teams including the above Kinuso team. 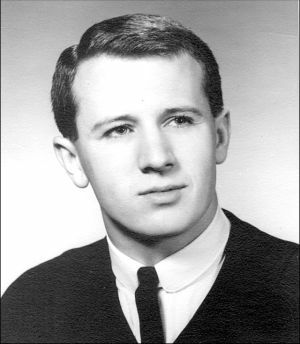 To help pay for his schooling in Edmonton, Allan applied for and received a High Prairie School Division Bursary. This Bursary came with the condition that Allan teach for one year in the Division’s region, which stretches from Girouxville in the west to Slave Lake in the east a distance of about 170 kilometres. 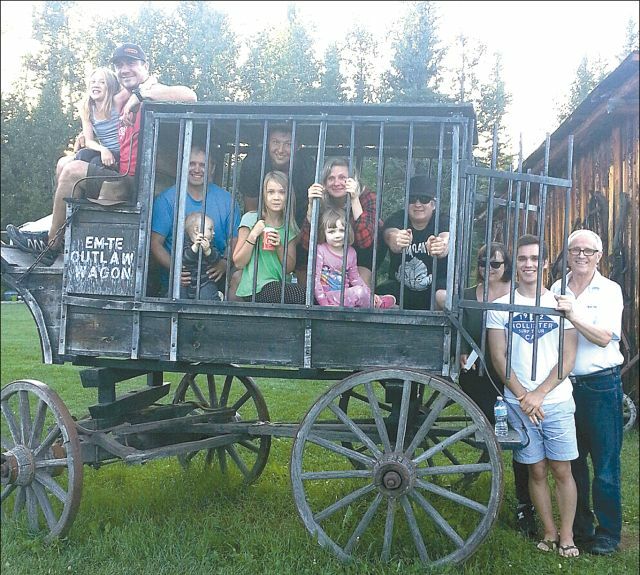 “I taught for about 20 years starting out in Faust, Alberta. Then it was E.W. Pratt High School in High Prairie. Then I became the principal of Kinuso School and after that, it was teaching in Slave Lake,” says Allan. “I worked hard at teaching and many of my students did very very well on provincial tests. I must say however, these students would have done well with any teacher. That is what good students do. “My best students ( just a few of many and who were all way smarter than me ) were Laura Hamson, Neil Decorby, Tracy Morton and Mary Anne Taylor. And by the way I want to retroactively change the grade I gave to Laura Hamson in about 1969. She wrote a beautiful paper for Grade Ten Social Studies. It was amazing and easily up to first year University of Alberta standards. “It was truly excellent I went through it and took off one small grammatical error and gave her 99%. Laura went on the get a Masters degree in French history, went to law school and received the Gold Medal for Law. 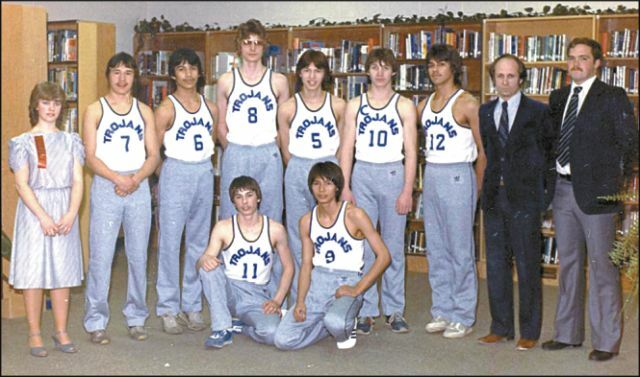 There were star athletes in Northern Alberta in the Crawford years. “The best basketball team I ever coached was the Kinuso Knights. This team went all the way to the Provincials in Lethbridge and won the Sportsmanship tropy. Sports memories are not the only memories of Allan’s teaching days. Allan made the decision to change careers in 1985. After moving to Edmonton in 1986, Allan entered law as an adult student, age 41, at the University of Alberta. He says the transition from a life of teaching to life as a student hard to make. “I have to tell you I found first year law school quite difficult. The approach is just different than any other subject mater. I just passed my first year. In second year I started to figure things out and received fairly good grades. By the third year I had learned not to read every case from beginning to end but, like the younger students, just get a summary and read it. After that, I obtained very respectable grades. Allan graduated from law school in 1989, and was called to the Bar in 1990. In 1991, Allan opened his own practice in High Prairie. About ten years later, Allan moved to Grande Prairie. He continues to serve clients across the Peace River country, from Grande Prairie to High Prairie to Slave Lake. “Since my move to Grande Prairie, I have only done criminal law instead of civil law and other legal duties. I find criminal law by far the most interesting. I also do not do family law cases now but I am doing family mediation. These days, Allan is concentrating on solving family disputes through talking things through. This ‘Family Mediation’ is an area in which he specializes. Over the past years, he has helped bring sides together in over 400 cases. In Allan’s words, “Everyone in the family will probably feel better if the issues can be settled in a co-operative manner. Allan says his career in law continues to be interesting, and is always a great topic of conversation with people he meets. “People almost always assume that since a person is charged by police with a crime, they must be guilty. This is not the case at all. My answer to this then – It is not the police that decide who is guilty. The Court decides. The system means police lay charges. The Crown lawyer or lawyers prosecute. The Defence lawyer or lawyers defend the person charged. “There are a ton of ‘war’ stories I could tell but I’m going to limit this to two, each of which I consider to be hilarious situations. “First, a fairly large guy from Grouard got me to help him with a matter in court. The result was successful and I billed him $500.00. Despite a few calls and a letter he did not pay or even answer. About two years later he was in court again. “The second situation, I go to court in Valleyview where a Newfie is being held and charged with assault with a weapon on a police officer. “The man was arrested for public intoxication but he had a large dog with him. The police didn’t know what to do with the dog, so they put the dog in the next cell to the Newfie. In the morning they checked on the prisoner, and then stepped into the cell with the dog to see how the dog was. “Just as the mountie enters the dog’s cell the Newfie yells out, ‘Get him Boy!’ The dog attacks the officer by the arm and starts pulling on his shirt. Anyway, it turns out if you sic an animal on someone, that constitutes assault with a weapon. “The officer involved graciously agree to make the charge into a lesser charge of Mischief. Left to right: grandaughter Sasha, son-in-law Andrew, son Clayton, grandson Harrison, grandaughter Tessa. son Evan, grandaughter Lily, daughter Charlene, son Gary, daughter-in-law Marce, son Andrew and Allan. So what will Allan be doing in the future? “I don’t really know. I may retire when I am 75, which would be about 2021. However, I am stubborn enough to just keep on going! The ‘Crawford Ethic’ at work! “These days, I hope to get a small band together and play in venues frequented by people over 50. “I am also trying to get certified to fight in Seniors MMA (Mixed Martial Arts) events which are held in Singapore. I know this is laughable but I am actually looking for sparring partners! “If you creep my Facebook page, you can see a recent video I posted. I encourage people to view it and offer to spar. Or, just Facebook me and let me know how big a mistake I am making! “On a more serious note, I always thought we have good representation in politics, but I may make another stab at that. “Right now I am not a big fan of the NDP but who knows, they may learn. If they do not, well, I might consider running as an independent or with one of the more conservative parties. 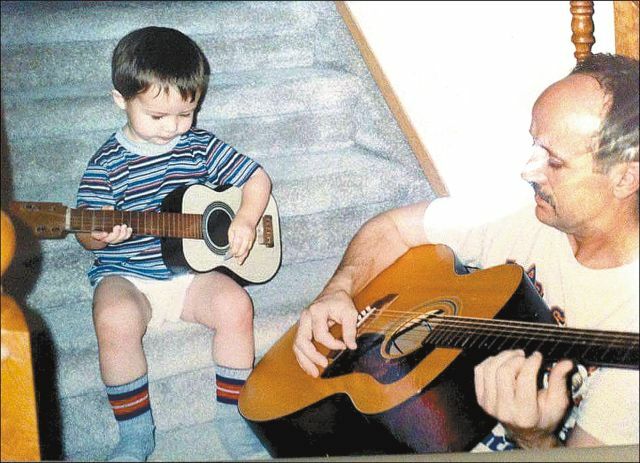 Allan with his son Evan learning to play guitar at age two. He is now 22 and has an album out on ITunes, Evan Crawford Clockwork Heart.